It’s the downfall of many a summer night. 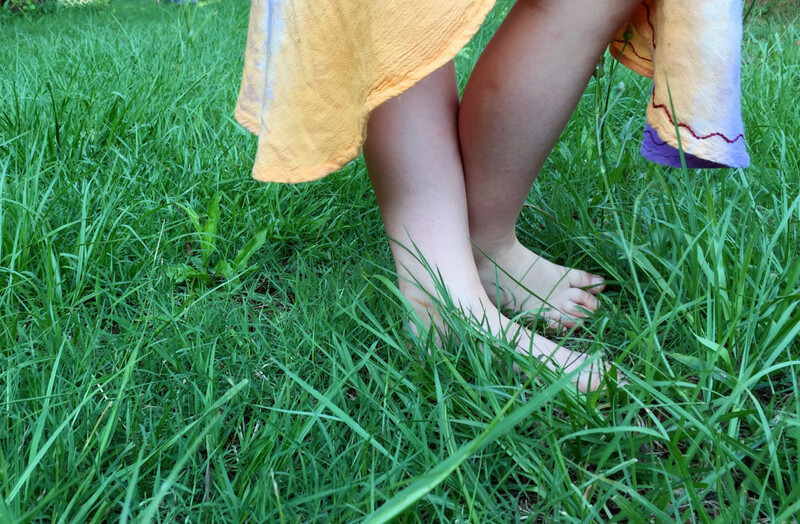 There’s nothing like relaxing and watching the kids play barefoot in the backyard, catching lightening bugs or playing hide and seek…until the itching begins. And yeah, there are plenty of crazy home remedies that we can use to try and ease their discomfort. Lime juice, toothpaste, garlic…but I prefer to keep my groceries in the pantry and not slathered all over my children. What if we could keep the bugs from biting in the first place? 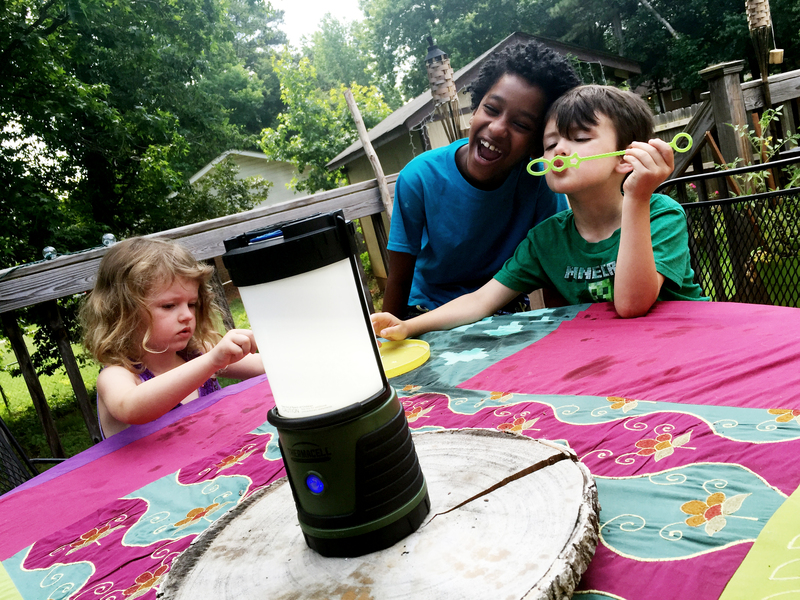 As a family who spends a lot of time outdoors, we were more than happy to give Thermacell’s new insect repellent camp lantern a try. If this works, I thought, it’ll change the way we do everything. I cringe every time I spray the kids down with chemical-y smelling bug spray. I can’t stand camping in a beautiful site in the wilderness zipped into a mesh screen that keeps the bugs AND the view out. And at home, how many nights have we had to grab our plates, piled high with burgers and potato salad, and retreat into the house? Everyone knows that kind of summer food is meant to be eaten outside! Who do these bugs think they are? Like a beacon of hope….the lantern arrives. When the Thermacell arrived, I opened it up immediately to investigate how it works. Basically, the lantern doubles as a light and an insect repellant. A small butane cartridge heats up a metal grill that’s part of the lantern’s design. A small mat, saturated with repellent, sits on top of the metal grill. Heat vaporizes the repellent, allowing it to rise into the air. The actual repellant is a copy of one that naturally occurs in chrysanthemum flowers. It repels mosquitoes, black flies, and no-see-ums, and is completely safe for people and pets. 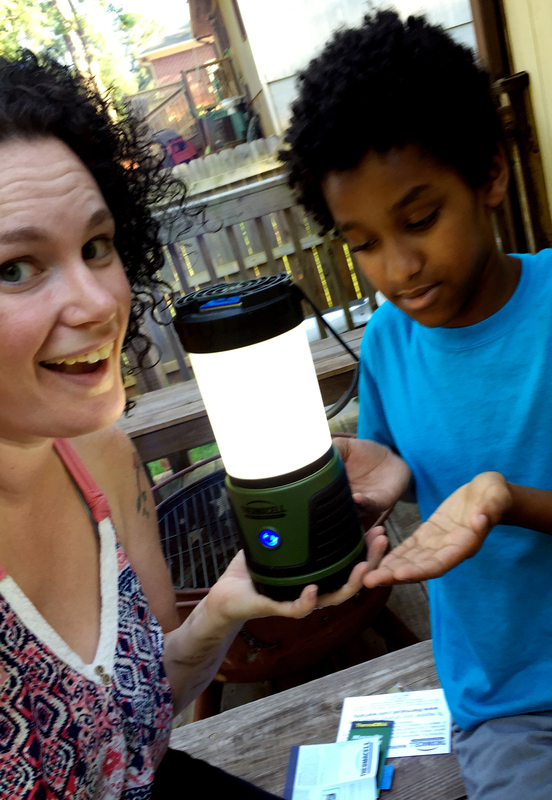 My son and I got the lantern assembled with no problems and wanted to try it out immediately. I decided that our first test would be the ultimate summer destination. A place we love. A place we want to go often. A place that the mosquitos love almost as much as we do. Our. Own. Backyard. (Dun DUN DUNNNNNNN). I reached down to scratch the three bites I’d acquired in the short time we’d been outside. Grrrr. “Okay, do your thing!” I activated the lantern and set it up on the table. Operation Patio was on. We hung up the strands of lights we’d abandoned in the shed. We swept the deck and put some burgers on the grill. We lit the tiki torches and cranked up the speaker. My husband and son tossed the football and my daughters blew bubbles and talked to the neighbor kids next door. We were taking back our backyard! Is there anything sweeter than little bare feet in summer grass? Later that night, when we were all getting ready for bed, I didn’t have to dot the kids up with medicated creams or deal with any I’m-So-Itchy-I’m-Gonna-Die tantrums. No one smelled like chemicals. The kids were nice and tired from playing outside. My husband and I snuck a little extra time on the patio, talking after they went to bed, and we agreed this was a game-changer, both for camping and for our home. I can’t imagine why anyone wouldn’t spend the $60 for the Thermacell and, in return, get those sweet summer nights back. 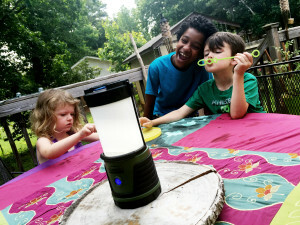 For an outdoors-loving family, this lantern is a must-have. Enjoy your summers even more…you won’t regret it! Sounds interesting. I imagine that if I got this, I would need to keep buying repellant refills . So, what’s the scoop on this? I get around 4 hrs of usage out of a repellent wafer and around 6 hours out of the gas cartridge. It’s perfect for putting around on your patio or campsite. You can easily get the refills at a Walmart so that’s not an issue. 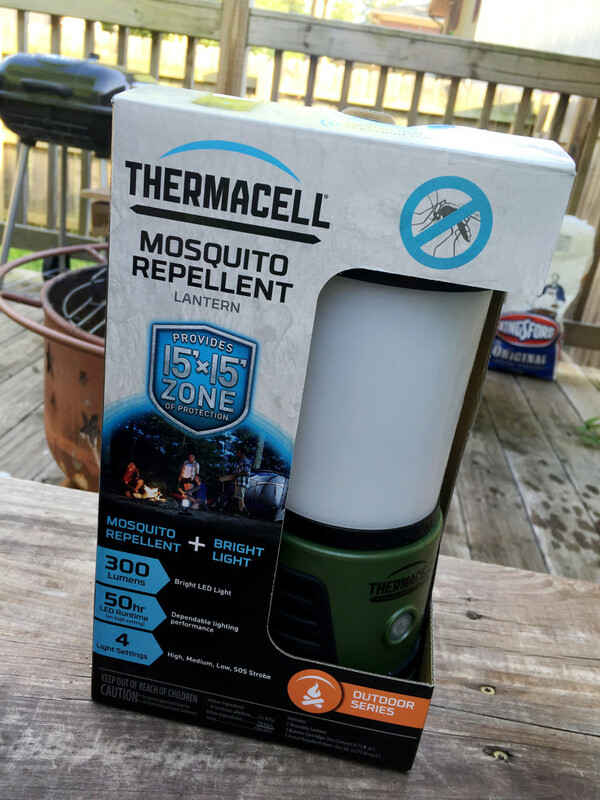 THe best part is that you can just use the light or just use the repellent. On weekends when we are eating outside, we will turn the repellent part on and place it around table. There is a slight odor, but you can’t really smell it unless you put your face to it. Sorta like a citronella candle. I can’t believe more people don’t use this. It’s one of the few mosquito remedies that works. we have been using them for years thermacell has a couple of diffrent models so you dont have to spend $60 they all run on the same butane cartridge and same repelant pad. And they really work. base model starts at twenty to twenty five and refils are cheap as well. equil to buying bug spray. well worth the comfort and anti itch. I’m going to look into these. I don’t like putting chemicals on my skin, but not even the baby lotions or Avon stuff keep bugs away from me. We have the older lantern style, works good if you stay within the 15×15 area. The belt ones work good if you are moving around a lot. A good fan placed behind where you are sitting will keep away a lot of the Mosquitos also.